In a sauce pan, combine quinoa with 1 cup of water. Bring to a boil then allow to simmer with a lid on for 12 minutes or until cooked. Remove from heat. A) the oven in a shallow dish with a bit of water at 350 for 40 minutes or until soft. B) in the microwave on a plate with a bit of water on high for 8 – 10 minutes or until soft. Allow to cool. 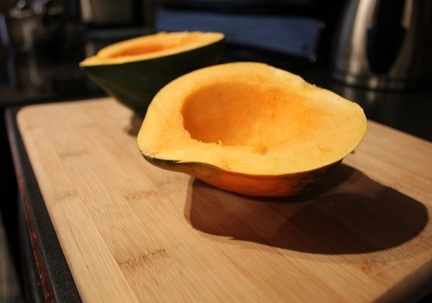 Once cooled, spoon out cooked squash (careful not to puncture skin). 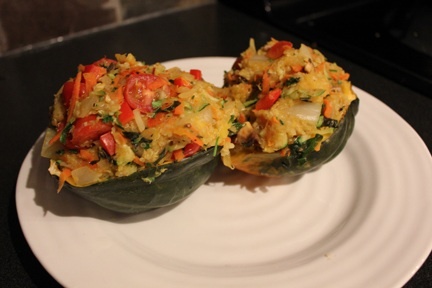 Add squash to cooked quinoa. Mix together until smooth. 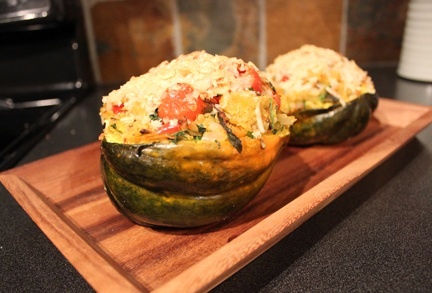 Place squash shells aside, they will being used as bowls. In a large frying pan or wok, over medium heat, add oil, onion, carrot and garlic. Cook until onion is soft. Add zucchini, red pepper, and mushrooms to wok and allow them to cook for 2-3 minutes. Finally, add tomato, parsley, basil, salt and pepper. Turn heat to low. Spoon squash quinoa mixture into wok and mix all ingredients together. Let ingredients rest on low for 3-4 minutes. Place acorn skins in Pyrex dish. Scoop mixture from wok into the skins. Pack in with spoon. They will be more than full. Top with 1/2 cup Parmesan cheese. Bake for 35 minutes, then broil on high for 2-3 minutes until cheese is bubbling.